This week I decided to put to use the breadmaker that has been sat in my cupboard collecting dust ever since I inherited it from my mother’s clean out. So, baby steps, I decided to make some pizza dough – not too time consuming or complicated, not to mention incredibly tasty. I know there are recipes out there for making your own pizza dough by hand, but I’ve yet to try any so I won’t recommend a specific one. I’m sure that Google can help you there. As a complete novice I wasn’t exactly sure of the procedure of how to manage the dough once it’s ready, other than what I’ve seen on ‘I Love Lucy’. So I squidged the dough out into a roughly circular shape to the size that I wanted my pizza to be, and then pinched in the edges to create a bit of a crust. In hindsight, I could have squidged a lot more and still would have been left with a (much larger) deep dish but hey, that’s what experimentation is for! One tip I did make use of was adding polenta instead of flour to shape my dough to give it the gritty kind of texture that I love in the classic takeaway. 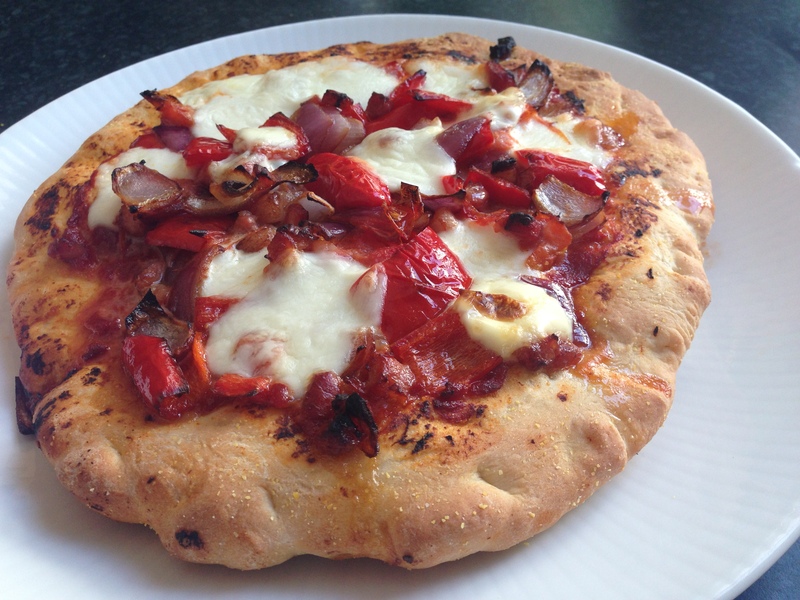 For the toppings I spread some tomato puree over the dough and add some grilled up pancetta and mixed vegetables – namely red onion, sweet pepper and tomatoes – then added in a quite frankly excessive amount of mozzarella and mascarpone. It’s a weakness. I’m getting help. Then I put it onto a flat baking tray and left it in an oven preheated to about 180* for around 15 minutes. Each oven is different and everyone prefers their pizza to taste a certain way, so just keep checking on it until you think it’s ready and then tuck in. This week’s cook off wasn’t particularly scientific or accurate, but boy was it successful (and tasty! ), so why not try a bit of experimentation once in while? Life is so much more exciting that way. This week I decided to try something a bit easier, and then proceeded to choose one of the more difficult things I could make: Hokey Pokey, or Cinder Toffee as it is sometimes known. It’s basically a homemade Crunchie bar. It sounds like an easy enough recipe, just sugar, golden syrup and bicarbonate soda, but the difficulty comes in knowing the best time to mix it all together. When you boil the golden syrup and sugar, you need to wait for as long as possible before adding the bicarb (without letting it burn), or you’ll end up with the kind of sticky mess that is sure to mess with dentistry. I covered it in chocolate to hide the slightly bitter aftertaste that comes with the bicarb, plus anything covered in chocolate is pretty good. 1. Put the golden syrup and sugar in a saucepan and bring to the boil on a medium heat, stirring constantly. 2. Once the mixture has begun to boil, turn the heat down to low and leave it for up to 7 mins. Only stir once or twice so that it retains heat. Keep a constant eye on the mixture as it can burn quickly if left. 3. Check the mixture by putting a drop in a glass of cold water, if it is sticky then leave it for a while longer. You want it to be hard and brittle. 5. Once the mixture has foamed up and the bicarb is mixed in, immediately transfer to a greased baking tray (I tend to just put a sheet of baking paper in as opposed to greasing – less washing up). Spread the mixture out a bit, but be careful not to flatten it too much or it will lose all of the air bubbles. 6. Leave it for 15 minutes. 7. Then either cut it up with a knife or just break it apart with your fingers, keep the pieces a decent size to aid the chocolate dipping. 8. Break the chocolate into pieces into a bowl then place it over boiling water in a saucepan and stir until melted. 9. Once the chocolate is melted, remove the bowl and saucepan from the heat. Take each piece of hokey pokey and dip into the melted chocolate ensuring that it is fully covered – you can use tongs or your fingers, whichever suits. 10. 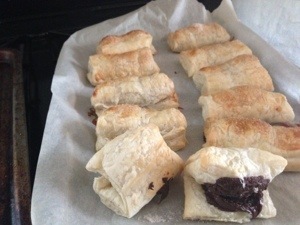 Place the dipped pieces onto a sheet of baking paper and allow to cool. If you are in a rush you can stick it in the freezer for 30 minutes. 11. Once the chocolate has hardened, enjoy! [Image via http://www.petitepigchocolates.com] I didn’t have time to photograph mine before my colleagues devoured everything! 1. Put the butter, golden syrup and dark chocolate in saucepan, stirring frequently over a low heat. 2. Once it’s all melted, pour in the cornflakes and mix it all together. 3. Spread the mixture out evenly on a baking sheet. 4. Melt the white chocolate in a glass bowl over a saucepan of boiling water. 5. Add the mint extract, adding in the milk if required to get the right consistency for drizzling. 6. 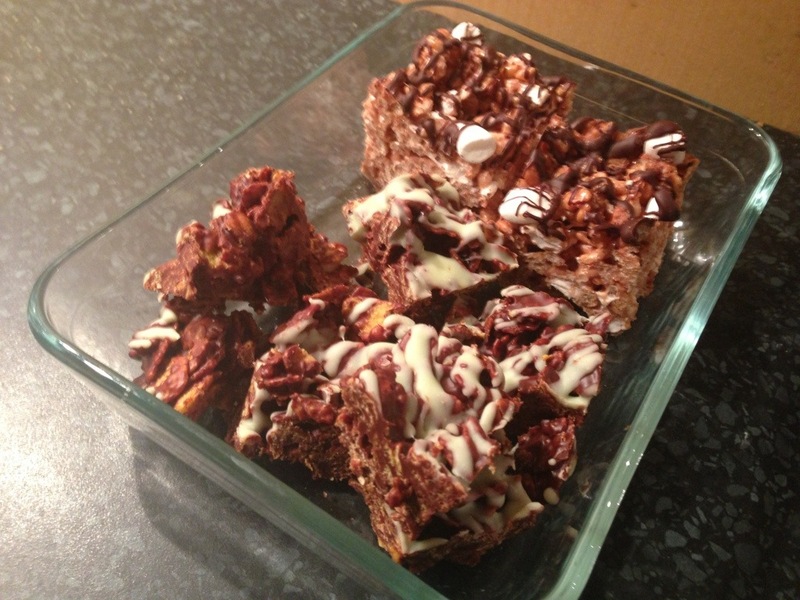 Drizzle generously over the cornflake mixture and refrigerate. I was in a rush so I put it into the freezer for half an hour. 7. Cut into squares and enjoy! This week I felt like experimenting with puff pastry, and luckily we live in a world where I don’t have to make the stuff from scratch. I chose to use chocolate (successful) and marshmallows (disappeared into a caramel goo) as my fillings, but I might try cinnamon or fruit next time. 4. Cut the sheet into the desired amount of sections (depending on how big you want your treats to be), I would say 8-12 pieces is about right if you’re making mini things. 8. Bake at 180 for up to 10 minutes, depending on your oven. Mine is basically a nuclear reactor so it was done in 8. Once they’ve turned golden brown, they’re done. 9. Best to let it cool a bit before eating, I learnt the hard way via some molten chocolate filling. I also found that the chocolate went quite hard once the pastries had cooled, but they can easily be reheated in the microwave so all is well that ends well. This week I made some brownies on a whim, I had a craving for some sort of cake and wanted something easy so I went to my recipe bookshelf and got cooking. This recipe is from The Chocolate Box, I haven’t got a photo because there are none left – but hey, everyone knows what a brownie looks like, right? 1. Lightly grease and line the base of a 20cm square tin. Preheat oven to 180C/Gas Mark 4. 2. Place butter, sugars, dark chocolate and syrup in a large heavy-based saucepan and heat gently, stirring until mixture is smooth and blended. Remove from the heat and leave to cool. 3. Beat together eggs and essence in a jug. Whisk it into the cooling mixture. 4. Sieve together the flour, cocoa powder and baking powder and fold gently into the chocolate mixture using a metal spoon. 5. Spoon into the prepared tin and bake for 25 -30 mins. Remove from the oven when the edges are becoming crisp and coming away from the tin, and when the middle looks just set. Leave to cool in the tin. When completely cool, cut into squares. My friend has recently gotten engaged and is busy planning her wedding, centred around the theme of apples and buttons. As a rather excited bridesmaid, I’ve been trying to think of a good cake to make for her (I’m a bit of feeder, cake is what I do), and decided on an apple one. As it was my first time making it, I followed the recipe pretty closely, if I was to make it again I would probably leave the cake in the over for a little longer, as I’m not a fan of squidgy centres. Other than that, delish. 1. Heat the oven to 160C/fan 140C/gas 3. 2. Cream the butter and muscovado sugar in a food processor for a couple of minutes, then mix in the egg. 3. Sift over the flour, baking powder and spices. Fold together, then stir in the apple. 4. Pour into a buttered, base-lined 20cm springform cake tin and bake for 1 hour, or until risen and browned. 5. 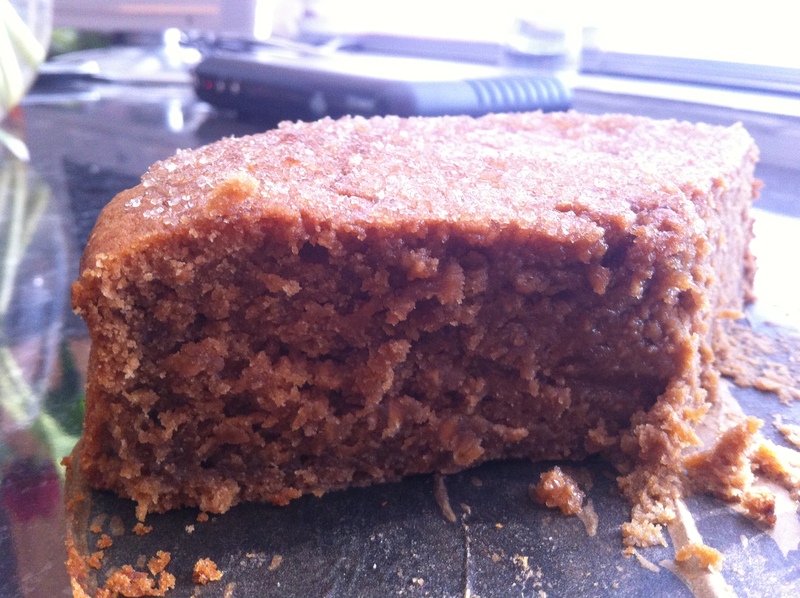 Combine the honey and demerara and spread over the cake while still warm. 6. Remove the cake from the tin and serve with cream or ice cream. Keeps for 3-4 days wrapped in foil. This week’s Sunday Cook Off is going to be a little bit delayed, as I’m planning to make a rather special cake on Tuesday. My friend has just gotten engaged so I’m making it for her and her brand spanking new fiancé! I’ll update this post when I’ve finished constructing the most ambitious and complicated cake I’ve ever made…wish me luck! On a snowy kind of day all you want to eat is a bit of comfort food, so I turned to my latest obsession – chunks of Double Gloucester and lashings of guacamole between two slices of crusty bread. Nom. It’s not particularly complicated (By which I mean it’s the easiest thing I’ve ever made), and it helps to fulfil my daily cheese quota. I am a great lover of cheese, my friend and I used to live by the rule that anything can be tasty as long as you add enough of the stuff. There isn’t really a recipe for this one as it’s quite self explanatory, but I’ll give you a rough guide. 1 – Take two slices of bread and butter one side of each. Slice as much cheese as you think is necessary and set to one side. 2 – Heat a frying pan (don’t add oil or anything else, that’s what the butter is for) and put in one slice of bread, buttered side down. Spread the guacamole on top and add the cheese, then pop on the second slice with the buttered side facing up. 3 – Wait a few minutes for it to crisp up and then flip and repeat. 4 – Gobble it all up. 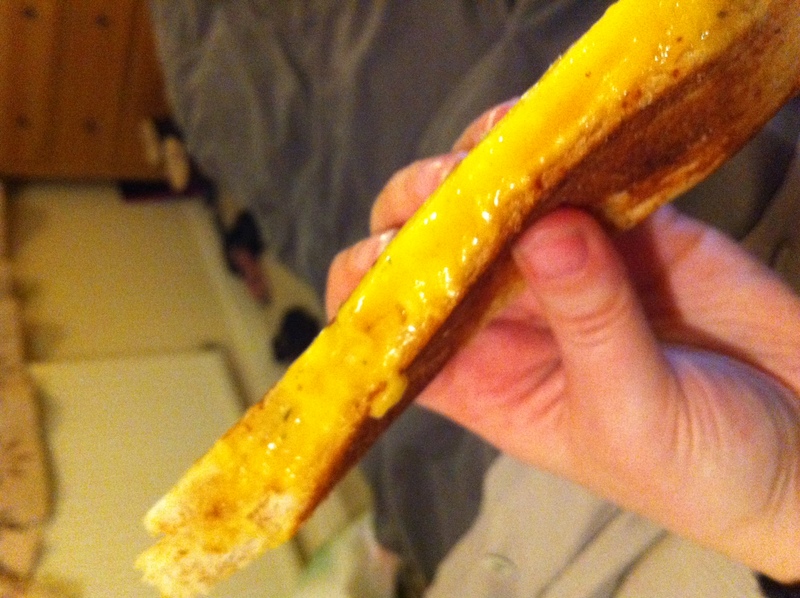 Apologies for the poor photo, but I was really quite impatient to get my teeth into the fatty goodness. And for some reason it’s come out sideways, again, sorry.